Virginia, United States – July 22, 2014 – Victory once again for Thermaltake! Carrying on the mission of “Delivering the perfect user experience”, Thermaltake continues developing innovative and amazing products being the industry leader in computer chassis, thermal solutions, and power supply units. After receiving the “COMPUTEX d&i Awards 2014”, Thermaltake is honored to celebrate the second victory with the “IDEA Award 2014” (International Design Excellence Awards) this year! 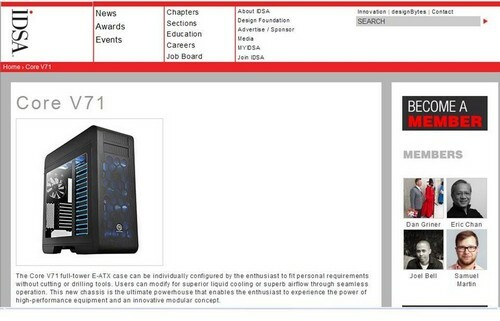 Standing out from numerous contestants, out of 687 finalists this year, Thermaltake Core V71 Extreme Full Tower Chassis is one of the undisputed winners among the category of “Computer Equipment”. For Mr. Kenny Lin, the president & CEO of Thermaltake Group: “The IDEA Award 2014 represents clear recognition for the level of innovation, benefit to the user, responsibility for the society, environment, culture and economy, benefits to the client, visual appeal and appropriate aesthetics, design research and strategy categories that demonstrated by our Core V71 Extreme Full Tower Chassis. It is an important confirmation of the long term corporate and product strategies: "Our pioneering spirit is undiminished, we are delighted to receive this! " 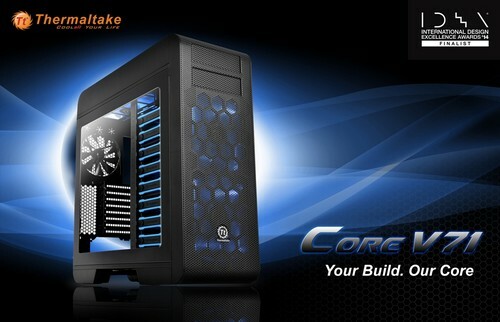 Thermaltake Core V71 is the new of its kind concept for more versatility and adaptability to any configuration. 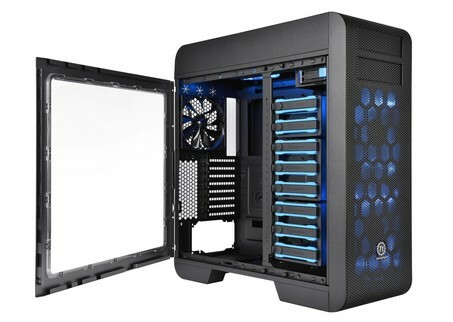 The Core V71 full-tower E-ATX case gives PC enthusiast flexible installation and keeps the system cool. 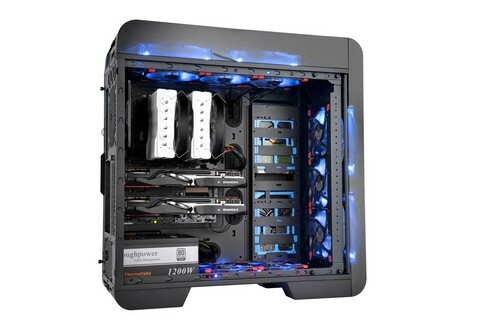 Users can modify for superior liquid cooling or superb airflow through seamless operation. This new chassis is the ultimate powerhouse suitable for any type of PC enthusiast – no matter liquid cooling or extreme airflow. Engineered with the subtle curves, bold textures and clean lines, among many award winning case designs from Thermaltake, the Core V71 keeps it to include enthusiast level features while keeping the design simple. The massive mesh design maintains a constant stream of fresh air inside the case while keeping the hot air out. With integration of a fan controller and LED indicator, which offers a perfect complement outside of the chassis. A highly customizable 5.25” & 3.5” drive bay feature enables users to freely interchange the 3.5” hard-drive cages to suit one’s need and removing the 5.25” & 3.5” drive bays to gain maximum interior space for advance cooling performance or liquid system builds. The Core V71 is built with an exclusive back tray design allowing users to assemble and expand easily and fast when all of the drive cages have been removed. Time saving screw-less assembly with the 5.25” & 3.5” tool-free drive bay design minimizes the hassles of installing ODD and HDD devices for convenience and ease of accessibility. Also, Core V71 is built with a fundamental airflow optimized design. Standard equipped with triple 200mm LED fans and a 140mm fan. It is the first in the market that has the ability to house 4x 200mm fans along with three more 120mm fans to achieve unrivalled airflow in your chassis. 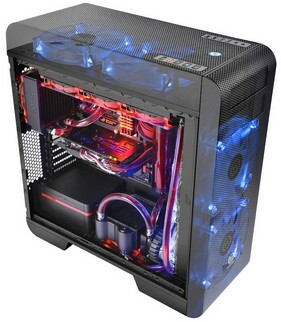 Core V71 pushes the envelope allowing users to utilize high-end water cooling solutions that feature up to a front 360/top 420mm, or front 420mm/top 360mm, along with rear 120mm and bottom 120/240mm radiators support for extreme performance. Marked by outstanding technical depth and organizational strength, Thermaltake insists to provide the best for worldwide users in every aspect. The praise and affirmation from international design awards push forward Thermaltake with its 3 brands－Thermaltake, Tt eSPORTS and LUXA2 keep building a world-class cultural brand for the enjoyment of entertainment, e-Sports, technology and enhanced lifestyle choices to all users!